Join the Flock for our First 5K! Natick Community Organic Farm (NCOF) is a 501c3 nonprofit educational farm providing productive open space, farm products, and hands-on education to people of all ages, year-round to the Metrowest community since 1975. Our 27-acre diversified farm's woodland backs up on to a lovely, wide, and flat section of the Cochituate Aqueduct known as the Eisemenger Trail that like the Farm is one of Natick's true treasures. We cordially invite you, your family, and your friends to run, walk, mosey or saunter with us along our beautiful, trail-run loop. 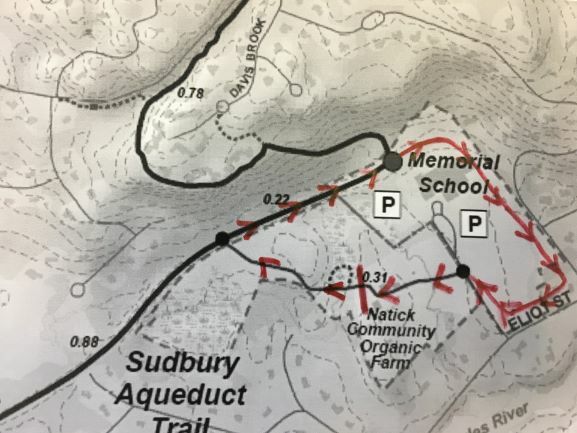 The course will start at the farmhouse, head off-road through NCOF's beautiful woodland, then turn right along the aqueduct before continuing on the grass boundaries of Memorial School and heading up the Farm's driveway into the yard of NCOF's historic 1815 barn. Choose to walk or run 1 mile (one loop), or go the full 5K distance (3 loops). 5K Run starts at 8 AM. Runner check-in and registration opens at 7:15 AM. 1 Mile Fun Walk/Run starts at 8:30 AM. Please arrive by 7:50 as driveway will be closed to cars at 7:50 AM. Families are welcome to walk around the farm and view the animals prior to the fun run/walk start time. Distances and directions will be clearly marked by experienced race coordinators. Adults pushing strollers are welcome to participate at one loop distance. No dogs please. Official numbers and timing services will make this a true race experience, while human and livestock course marshals will give it a distinctively farmy flair. The first 100 to register will receive a commemorative reusable mason jar drinking glass. All race participants will receive free admission to NCOF's Spring Spectacular outdoor spring event, which runs 10 AM-2 PM on the same day. Ribbons for the top 3 finishers. 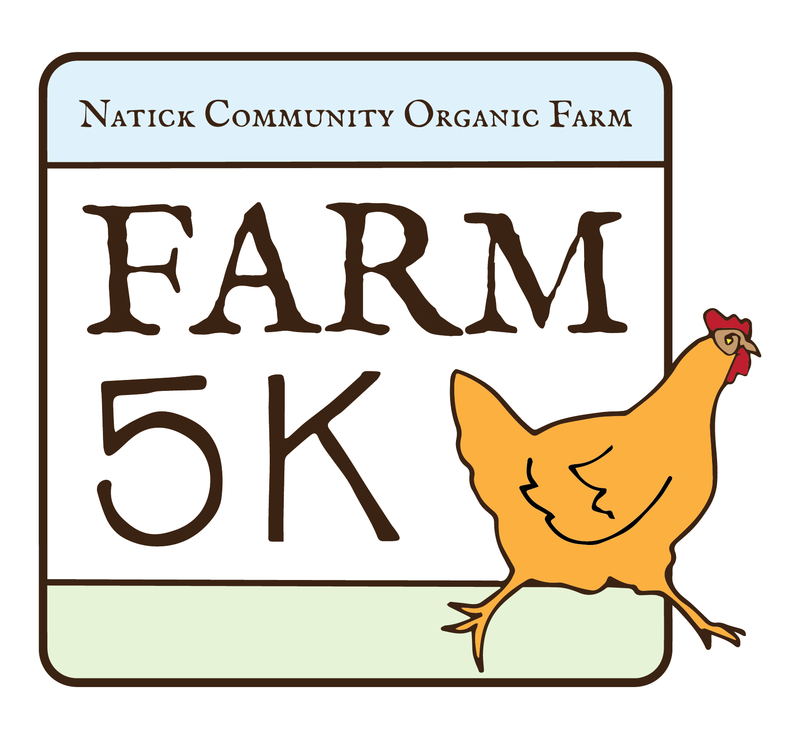 If you would like to volunteer for set up, clean up, or as a course marshal, please email events@natickfarm.org. In consideration of you accepting this entry, I, the participant, intending to be legally bound and hereby waive or release any and all right and claims for damages or injuries that I may have against the Event Director, RaceWire.com, Natick Community Organic Farm, the Town of Natick, and all of their agents assisting with the event, sponsors and their representatives and employees for any and all injuries to me or my personal property. This release includes all injuries and/or damages suffered by me before, during or after the event. I recognize, intend and understand that this release is binding on my heirs, executors, administrators, or assignees. I also authorize the use of photographs or videos that include my image for promotional, informational, or other reasons deemed to be in the best interest of the event. I certify as a material condition to my being permitted to enter this race that I am physically fit and sufficiently trained for the completion of this event and that my physical condition has been verified by a licensed Medical Doctor. Furthermore, I also grant permission for the use of my name and or picture in any broadcast, photograph, or other account of this race. I understand that bicycles, skateboards, roller skates or blades, or animals, are not allowed in the race and I abide by this guideline. I understand that all registration fees are nonrefundable and non-transferable. By submitting this entry, I acknowledge (or a parent or adult guardian for all children under 18 years) having read and agreed to the above waiver.